Dr. Narendranath Reddy graduated in medicine with distinction from S.V. Medical College, Tirupathi, Andhra Pradesh. He then went to the United States of America where he specialised in internal medicine at the New Jersey College of Medicine and Dentistry. Later he did his sub-specialisation in endocrinology and metabolism at the Mount Sinai School of Medicine, New York. He has been a consultant and a practicing internist-endocrinologist in Southern California for over thirty years. A fellow of the American College of Physicians and the American College of Endocrinologists, he is also on the teaching faculty at the Keck School of Medicine, University of Southern California. Four generations of Dr. Reddy's family are devotees of Swami, with Dr. Reddy himself having come to Swami at the age of five. For 25 years, Dr. Reddy and his family have had a Sai Baba centre in their home. 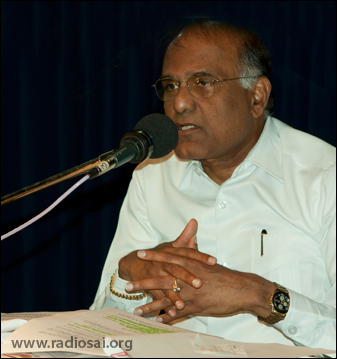 He is the chairman of the International Medical Committee of the Sri Sathya Sai Organisation. In addition, he serves as the President of the Sri Sathya Sai Society of America, Member of the Prashanti Council, and the Director of the Sri Sathya Sai World Foundation, which is the governing body of the Sri Sathya Sai International Organisation. 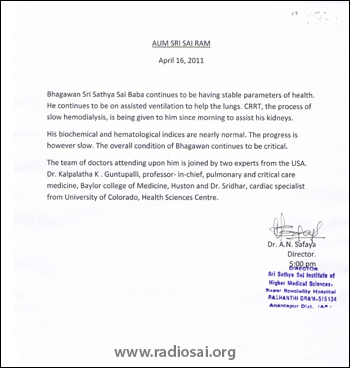 Prof. G. Venkataraman (Prof. GV), eminent scientist and the former Vice Chancellor of Sri Sathya Sai Institute of Higher Learning had a detailed conversation with Dr. Reddy (Dr. NR) about Bhagawan Baba's health on April 16, 2011 in the Radio Sai studio. Presented below is the suitably adapted and edited transcript of this conversation. 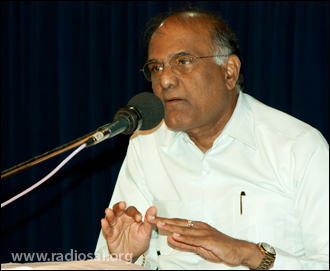 Prof. GV: Sai Ram Dr. Reddy and on behalf of all of us as well as the listeners all over the world I extend a warm welcome to you to our studio. You have of course been here many times but this is a very special occasion. I know you are tremendously busy; I can see it and I really feel a little uncomfortable disturbing you. But I have a duty to perform and there is something that only you can do. So I am particularly grateful that you are able to spare a few precious moments for us and for devotees everywhere. Let me straight away get to the point: How is Swami? You came here about two weeks ago and have been going to the hospital regularly and participating in the medical attention that is being given to Swami. So compared to what He was when you arrived how is He now? Please tell us. Dr. NR: First, with love and reverence I offer myself at the Divine Lotus Feet of our dearest and loving Lord Bhagawan Sri Sathya Sai Baba. Sisters and brothers, greetings of loving Sai Ram to all of you! As you mentioned I came here two weeks ago and saw Swami in the Intensive Care Unit, when He was critically ill. There's been definite improvement compared to what He was two weeks ago, but it is slow. Prof. GV: Okay, thank you doctor garu, and that was really comforting to hear and I am sure millions world over would feel the same way too. Now, you are a doctor and of course you are an ardent devotee of Bhagawan. In fact, your entire family is made up of nothing but devotees spanning across perhaps four or five generations. I am therefore going to converse with you at three different levels Dr. Reddy as a doctor, Dr. Reddy as a devotee and Dr. Reddy as a close acquaintance. Keeping that in mind let me start off with the question that covers spirituality as well as medicine. There is a reason why I am asking this question. The other day when I was returning to my room I met a couple. Incidentally they were from America but they have now returned to India and we exchanged casual greetings and a few words. Suddenly one of them said to me - and this was completely out of the blue you could say; it knocked me down. The gentleman said some people are telling that Swami's body being divine no doctor should touch It. Now, you are a doctor, what do you say about that? Dr. NR: I do not agree with that view point. Yes, Swami's body is Divine. But Swami Himself has mentioned I am not Mrnmaya (that which perishes); I am Chinmaya (one of full effulgence and awareness). So He is the embodiment of Sat-Chit-Ananda (Embodiment of Truth, Awareness and Bliss). But at the same time this Omniscient, Omnipresent and Omnipotent Lord has come in the human form. We have to then play our role and treat His body as a human body. 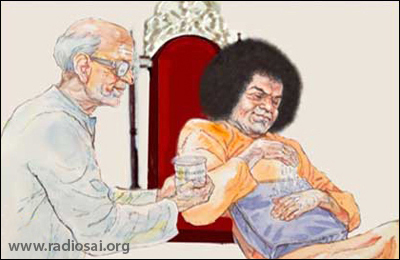 In 2003 when Swami sustained a hip fracture the doctors investigated and helped His body. They have done their duty. He neither condemned them nor did He say He needed that. But they had to play their role. Similarly as physicians we have to play our role. This is very pertinent. I can recollect an incident that happened during Krishna's time which is mentioned in the Bhagavatha. When Sri Krishna, the Supreme Parabrahman Himself, hurt His finger while cutting sugarcane, blood started oozing out. By His very Sankalpa (Will) He could have stopped the bleeding. His consorts, Rukmini and Sathyabhama were there, also present was His devotee Draupadi. Sathyabhama rushed to get a cloth and Rukmini was searching for something to be used as a bandage. However, Draupadi spontaneously and instantaneously tore a piece of cloth from her new saree and tied it around Bhagawan Krishna's finger. Her heart was filled with love for the Lord. This I think is a Divine play orchestrated by Bhagawan to show that each one has a role to play instead of thinking that God should heal Himself. Yes, He can do anything. As Swami says He can make earth into sky and sky into earth. But we need to play our role. In this instance the doctors as physicians have to do their duty. Prof. GV: In fact, now that you mentioned it I am reminded of a wonderful discourse Swami gave in Bangalore when He declared open the building, Sanskruta Sadhanam. Mentioning how in the Gita, Krishna reveals why the Lord incarnates, He went on to add a lot of fine prints, shall I say. One of the reasons He said God comes down as man is that then not only will devotees see God but also get an opportunity to serve God. And for that He creates opportunities in many different ways. You told a story about Krishna; I would also like to recall a similar one from Krishna's life. One day Krishna is lying on bed and complaining of a headache. Narada comes and asks Him what is wrong. 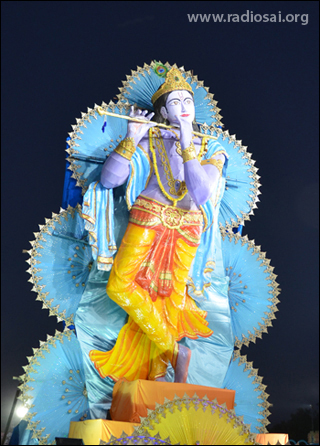 When Narada learns about the Lords problem, he feels something must be done and asks Krishna what he could do. Then Krishna says, Narada, you are a great devotee. I must put on my head the dust from the feet of the devotee alone to be cured immediately. Will you give some dust? Oh Krishna, what are you saying? I cant do that, replied Narada. Then Krishna told him to go and find some devotees, who are ready to give some dust from their feet. Narada goes in search and finds the Gopikas who are ready to do that. So he brings the dust from the feet of the Gopikas and the moment Krishna puts them on His head, His head ache is gone. Then Krishna says to Narada, You saw Me in pain but were not willing to give the dust from under your feet. But if I had done that, I will go to hell, replied Narada. Krishna then said, "That is the difference between you and the Gopikas. They are ready to go to hell; all they want is My welfare. I love the devotees who think only of Me and not of one's self." Dr. NR: That is a beautiful story. Love for love's sake, just spontaneous outpouring of love. There is no use of logic there; going beyond the mind and the intellect. God is beyond the mind and the intellect. Spontaneous love of Gopikas and Draupadi is what Swami expects. Prof. GV: Okay, thank you doctor garu, let me move on and ask an honest to goodness medical question. Here in Radio Sai we broadcast twice a day the medical bulletin issued by the hospital: one comes at 8 o' clock in the morning and another at 5 p.m. One word occurring in almost every bulletin is the word 'critical'. I am sorry to say, but people are upset and worried to hear that word. Now what does this word actually mean especially in the medical sense and why is it used? Dr. NR: When the patient has a critical illness, they are admitted to a critical care unit or intensive care unit. We then say that the condition is critical. We usually admit the patients in the critical care unit or ICU when they have involvement of multiple organs and also when we need a close monitoring and supervision of the patients vital signs, parameters and lab data. For instance, in USA and probably here as well there is one nurse for about 10 or 20 patients, whereas in the intensive care they need to have such close supervision and observation that there are three nurses per patient to monitor and supervise intensely and closely because of the magnitude of the multiple medical problems. That is why it is called critical illness because they need close monitoring and supervision. Prof. GV: Can I ask one or two small questions by way of clarification? Prof. GV: You see, let us say a patient goes for a heart operation an arterial block and a by-pass surgery. So many people have undergone this and they are generally taken to the ICU or critical care. That does not mean it is life threatening. But they have to go through intensive care. So the word critical is normally used at that stage. So it doesn't automatically mean life threatening. Dr. NR: No, not necessarily! Prof. GV: Unfortunately we tend to associate it that way and the moment we hear we panic. Dr. NR: You have made a very important point because critical care means, as you said very clearly, the people with routine by-pass surgery are admitted in the critical care unit for close observation varying between 24 to 48 hours. After that they are sent back to their wards. Prof. GV: It is part of a special medical procedure. Dr. NR: Yes, special medical procedure where the patient is watched very carefully and some patients are kept for a longer time depending on the magnitude of the problem and the rate of the progress. Prof. GV: Okay, thank you very much for the clarification. Here is another question that's also based on the daily bulletins. I am asking you this because we are getting many anxious phone calls and emails that essentially say to us: Listen, all the bulletins sound pretty much the same. What is happening? Is Swami improving or not? I can understand their plight. In fact sometimes when I read the bulletins, it is sort of mystifying. So on behalf of all of them let me bluntly ask you that question. Dr. NR: It is true; some times when you look clearly at the bulletin, it looks the same whether you are a medical or a non-medical person. So it is a very valid question. But as a physician I can see that there is progress, although it is very slow. We should understand that Swami's body is Divine yet physically it is 85 years old and the progress is therefore slow. Also in the critical care as physicians we observe that the condition fluctuates from hour to hour, day to day. So when the physicians give the statement they do so depending on what is happening at the particular time. It could be critical but the critical condition is stable. People should not look at critical and stable separately. The particular critical condition can be stable. That is what the bulletin says. Stable does not mean a lot of improvement or complete recovery. Prof. GV: That is normal, isnt it? It happens all the time. Dr. NR: It happens day in and day out. Actually we see that in critical care conditions things can change from morning till evening. As doctors we see that all the time. People who may think we would discharge them the next day might suddenly go sore in the afternoon. Same way suddenly people can start improving. As physicians we see that it fluctuates from hour to hour, day to day. It is very difficult for the doctor giving the statement to go into the minute details. Actually when you give too many details to the general public they get confused and that would create unnecessary anxiety. Even though we are medical persons, sometimes only those of us who specialise in that particular field alone understand the situation clearly. So it is very difficult for laymen to comprehend the whole facts. That is why the statements look monotonous and the same; but we cannot do otherwise. Prof. GV: This kind of fluctuation is normal? Dr. NR: It happens with many patients. I said Swami's body is 85 years old. I want to correct myself. As a physician I say that; but we all know as devotees He is Kalatheethaya (beyond Time): He was there, He is here and He will be there with us forever. So as a devotee I want to correct myself that He is Kaalaya (Embodiment of Time) and Kalatheethaya (One Who Transcends Time). But as a physician since His body has crossed 85 years, the process of recovery is slow. Prof. GV: Okay, now can I ask a related question? Many people complain and we hear this complaint from people who have been coming here for several years and who in many ways have been associated with Swami. They all come here and want to see Swami. But none of them are allowed. So they say all we want is a glimpse of Swami. What is lost if we are allowed to see from a distance? That is their point of view. I am not trying to defend it or anything. But you are a doctor; you know how to take care of people who are in critical care condition. What is the dharma of the doctor placed in the situation? Maybe you can explain to the audience why this is being done. Dr. NR: Sure! First I would like to say as devotees we all adore Swami and want to have a glimpse of Him. There is no question about that. There are many people who have come, our own family members, the relatives of the doctors, and so on. Many of them, even though they are doctors, aren't allowed to go and see Swami. We all love to see Him. But practically speaking, as a physician when the patient is in the intensive care we need to follow certain rules and regulations for the safety as well as privacy of the patient. It is the standard medical practice all over the world in good hospitals. For example, in USA we have what is called HIPAA (Health Insurance Portability and Accountability Act). You can never reveal any information about any patient to the general public from your office or the hospital. You will be legally liable for that. I can give an instance. We go and do medical service in America in poor neighbourhoods. Even there we cannot take a photograph unless we get a written consent from that particular person receiving service. That is respect for human rights and privacy in general terms. But more importantly when the person is in the intensive care, in general the immunity is compromised; they are easily susceptible to infection. So whenever somebody walks in they are subjecting the person to more infection, and thus delaying the recovery. That is the greatest disservice one can do. If you really love Swami then pray for Him; but please do not try to visit Him now. Another thing is doctors in the critical care unit are so much concerned and occupied taking care of the patient. Visitors interfere in their concentration and commitment and prevent the doctors from delivering the best medical care. That is why visiting patients who are in the ICU isn't really advisable. Besides, this is the standard medical practice. My own family members who are doctors themselves were not allowed. In general, the practice even in the USA is that the doctors who are taking active part in the medical care of the patient, that is, the doctors-in-charge and the consulting doctors, are the only people entitled to see the patient. Otherwise it is not a very practical thing for the management and delivery of good care. Not only that we have to respect the rules for the sake of Whom we love. Swami wants us to respect the law of the land whatever be the rules and regulations. This is our dharma and duty and as I said even though as devotees we love to have a glimpse but at this point it is not correct. Even all the senior Trust Members too respect these rules. So we appeal to all the devotees too to conform to this. Prof. GV: I think you have made two important points here. First, if you let in one you have to allow so many because everyone will try to extend the privilege. And each one of them will be a disturbance to the doctors. Secondly, they will be adding to the infection burden of the patient. Both are totally unnecessary. It just occurred to me that even in our temples no one is allowed inside the Garbhagraha (the Sanctum Sanctorum) except the priests. If you want the darshan of the Lord you have to stand outside. So that is a point well understood now, at least I understand it and I hope everyone would. Now you mentioned about hospitals in USA. I would like to ask a small question in that context. You have been in America for maybe four and a half decades and you have so much experience with the hospitals there. You have served in many of them including the very best. How would you compare the treatment being given to Swami with the kind of attention a patient with a comparable medical condition would have received there in America? Dr. NR: I am very glad you asked this question. I have been a practising physician for about four decades in USA and also have been coming to Sri Sathya Sai Institute of Medical Sciences, Puttaparthi from the time of its inauguration. 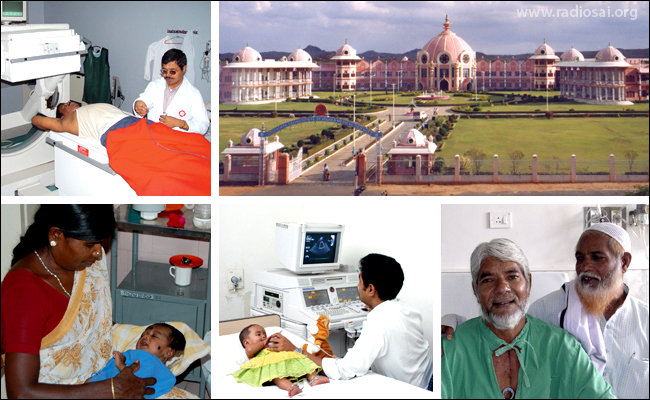 In this Hospital, which Bhagawan has built for serving humanity at large, I find two important aspects of delivery of health care. One is the professional expertise and the kind of faculty members who are offering the service and the second is the equipments and facilities available to deliver the medical care. The third important aspect as Swami says is the ideal health care, which involves delivering with love and compassion that fortunately all Sai physicians including the nursing staff and paramedics do. Here we have the state-of-the-art medical equipment, which Swami insisted on from the beginning. He had said that just because we are delivering care to the poor, the care should not be poor. The Sri Sathya Sai Institute of Higher Medical Sciences, Prashanthigram will complete 20 years of its existence this November. It has been two decades of free and fulfilling service to the needy and the distraught offered with Love. Prof. GV: That is a good one! Dr. NR: So we should try and deliver the very best. He used to insist and demand that we should never go for secondary and second-hand equipments. Use always new and good ones, He emphasized. That is why we have here state-of-the-art equipments. Also the doctors here are very dedicated and competent. I have interacted with them; they are good physicians. As per the interaction I have had with the local team of doctors and the consulting physicians I am convinced that the treatment Swami is receiving now is excellent; it is very good. Actually we have a group of doctors the local team, who are in the permanent faculty here assisted and joined by the team of doctors and consultants visiting from premier hospitals in Bangalore, Delhi, Hyderabad and some overseas physicians. In fact some of the very competent physicians visiting from overseas are specialists in intensive care and critical care. One of the doctors was the President of the American College of Chest Physicians; another is the Chief of the Pulmonary and Critical Care Medicine in Emory University in Atlanta, the third is from the Colorado Health Sciences. So we have lot of renowned and distinguished physicians from overseas as well as the local physicians. I also recently met a renowned hepatologist and gastroenterologist from Hyderabad who has been visiting and assisting Swami's condition. So we have very distinguished and qualified physicians from all over the world taking care and everybody is of the same opinion which is - Swami is receiving the best medical care. Also we should remember that among the experts there may be different viewpoints but the consensus in general terms is that He is receiving the best medical care. Another point I want to mention here is that all of them, be it the visiting consultants from abroad or the those from India, mention one thing and that is they are really impressed and very much appreciative of the dedication and love of the doctors attending on Swami; they are serving Swami day and night sacrificing hours of their sleep. They are truly exemplar professionals of Ideal Sai Healthcare. In summary, Swami is receiving the state-of-the-art and the best medical care. Prof. GV: That is really very reassuring Dr. Reddy. Now before I go to the next question I just want to say something. Dr. Safaya, the Director of the Hospital always used to tell me that in this hospital patient is God. That of course was said in a certain sense. It so happened that God Himself has become a patient probably to teach us some lessons, I do not know. But let me get back to practical details. You used one term - intensivist. I can sort of guess what it means. But I have never heard this term until recently. Can you please explain what that means and what exactly an intensivist does? Dr. NR: In very simple terms, in layman's language, a doctor who takes care of an intensive care patient is an intensivist. We use the words intensive care and critical care interchangeably. So they are intensivists or critical care specialists. So any person who specialises in taking care of the patients needs in intensive care is called an intensivist or critical care specialist. Let us be careful. There is another word called 'internist'. They are general medical doctors who take care of general medical problems and later specialise in various fields like cardiology, chest diseases, anaesthesiology, etc. Once you specialise then there is another specialisation called critical care and intensive care. It is a two year course and then they take the Board examination and are considered as critical care specialists. As I mentioned to you there were intensivists coming from Delhi and Bangalore and now there are three from United States. They are all critical care specialists. They have qualification in internal medicine, cardiology or pulmonary medicine and also critical care. So they are specially focussed in their attention on how to take care of the patients when they are in the intensive care because they have multitude of problems, involving multi-organ systems. So they need to have special acumen and special way to assess and take care of the patient and at the same time co-ordinate the efforts of the other sub-specialists who are taking care of the patient. That is why it is a very new and important field that is developing all over the world, especially to look after patients in intensive care. Prof. GV: So as I understand, the intensivist co-ordinates with the other specialists like pulmonologists, nephrologists and the cardiologists who give attention to the patient in specific areas and makes sure that all their instructions are properly implemented in the right manner with due regard to the dharma and procedures of the critical care unit. Is that right? Dr. NR: Yes. Actually for example in this instance Swami had cardiologists and cardiac surgeons seeing Him. Nephrologists, anaesthesiologists, endocrinologists, ophthalmologists and gastroenterologists each one specialising in their respective fields saw Him as well. They have their focus on their particular field of speciality whereas the intensivist or the critical care specialist has his own speciality like cardiology or pulmonary or anaesthetics. In addition to that, their focus is on a broader view of total complete care of the patient. They interact with specialists of all concerned areas and at the same time co-ordinate and get the input from other specialists. That is where they have their special expertise. That is really needed in the good and effective delivery of medical care. Prof. GV: So I guess these people spend most of their time in ICU and they really know what not to do there! Dr. NR: Yes, you are right! Most of these people don't even do office practice because they are so busy with these very acutely and critically ill patients. So most of their time, as you clearly mentioned, is spent in the hospital in taking care of these patients. Prof. GV: They know how to react to situations from minute to minute. Dr. NR: Yes and that is very important. That is why they are intensivists or critical care specialists because as I told you earlier things can change from minute to minute, hour to hour; so they should be tuned as to how to immediately respond to the changing conditions of the patient. Prof. GV: That is real education for me; there is no limit to what one can learn! Now let me move on. As you know Swami was admitted to the hospital in the evening of March 28 around 4 p.m. and I was there. I believe it was because His heart beat was irregular and so they implanted a pace-maker. Subsequently the medical bulletin started referring to lung, kidney, etc. This alarmed many people including myself Swami went for heart trouble, what is happening? Why are they talking about lungs and all that? But there must be some kind of background to this. Maybe we are getting alarmed because of our lack of education and ignorance. Can you help us understand all this from a medical point of view and put us at rest? helps in the electrical function. Dr. NR: One thing we must remember is that the body is a mechanism where everything is interrelated and interconnected. Suppose for example if one has diabetes we cannot say it is a sugar disease. It is not just that; it affects the eyes, kidneys, nervous systems, so it affects many organs of our body. Similarly Swami went for irregular heart beat or intermittent heart block and so they put a pace-maker. Then they had to watch Him closely. But in the process His blood pressure went down because as you know heart is a pump. 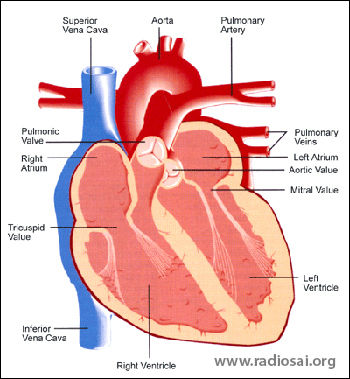 Heart has two actions: One is pumping action which is a mechanical one and the other one is electrical. They were taking care of the electrical problem by putting a pace-maker because the irregularity of the heart is a real electrical problem in nature. So they tried to fix it by putting the pace-maker. Meanwhile the pumping part gave a little bit of problem and the blood pressure went down. Heart is the main pump, which supplies blood to all the organs of the body be it the brain, the kidneys, the limbs every other part. Now if the blood pressure goes down even if it is for maybe a short while it affects the functioning of the other organs. That is why the kidneys' function was impaired and we had to put it under dialysis. The lungs also needed help so He was put on the ventilator. Similarly, the liver function goes down because the blood supply and the level of oxygen drops. This is what we call the natural sequence of the events because in the body all the organs are interrelated, and this is nothing unusual. It happens and we see this in patients who are undergoing treatment in the critical care unit. Prof. GV: That is reassuring and I suppose that is when they began to give assistance to the various organs by putting a ventilator, doing the dialysis and so on. Am I right? Dr. NR: Yes. For example if the lungs are not functioning well, if the lungs or the muscles cannot compensate, they need some support until they start recovering. Once they recoup - there are parameters the doctors use to measure the improvement - what we call as the weaning period starts and a day comes when you stop it. Similarly they try to help the kidneys. The kidneys get rid of the toxins from the body through the urine output. When the kidneys fail to do that the toxins build up and some fluids accumulate in the system, which is a load on the heart and lungs. When our own kidneys are not able to get rid of the toxins we need help and that is what we call as dialysis. Swami had dialysis with the CRRT mechanism to get rid of the fluid. As the kidney starts improving slowly the dialysis frequency is cut down and the patient is slowly weaned off from the machine. Whenever the natural body mechanism starts, the body heals itself and once it improves slowly we can stop the external help. We hope and pray to Him since He is God and by His very Sankalpa (will) in a trice He can make everything recover and function normally. But here as a physician, I am telling how we support the system until such time the body recovers naturally and takes over. Prof. GV: When you are saying all this I am reminded of something. Here we are in the studio and we depend on electric power. But we know our electric power system; it chooses to fail we cant say when. We have a back-up system UPS; when the power fails that comes automatically to our help. I suppose all these organ assistance and assisting devices are invoked in the same way because the heart didn't work to supply enough blood. Dr. NR: It is a good analogy. Prof. GV: Now, we have been discussing a lot about Swami's health from a medical point of view. We know from the past history of this Avatar, going back to the 50s and so on, there were many occasions Swami has been extremely ill, in particular I am thinking right now of the illness that He had just before Guru Poornima in 1963, which Prof. Kasturi has recorded in the most graphic form. As far as I can recall of the account Swami had paralysis, then He also had heart attack, everything going together. It seemed like an incredible crisis. Then He came out of it all in the most dramatic fashion. He merely sprinkled water on Himself on Guru Poornima day, then got up and spoke for an hour. He ended the discourse by singing the bhajan Subramanyam Subramanyam... which is a real fast one. It was one of those stunning situations. The Guru Poornima of 1963 saw Swami perform a stunning act. 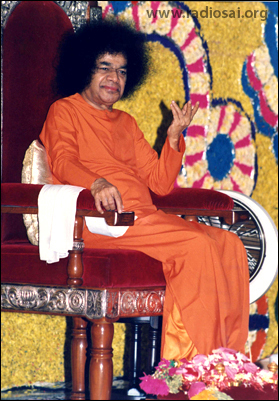 Bhagawan just sprinkled a few drops of water with His right hand onto His left hand and limbs, and lo and behold the paralysed left side became perfect in no time and Swami then rose to give a powerful and revelatory discourse in the Bhajan Hall in Prasanthi Nilayam. The other instance is the appendicitis incident that happened in Goa. The entire medical college came there. Suddenly He got up and said arrange for bhajans; went into the bath room, had a shower, shaved and wore a robe and came as fresh as a rose. Those things used to happen. Those were the occasions when He took on the illness of somebody even fractures or heart attacks limitless illnesses from ones colds and coughs all the way to paralysis and stroke. But this is an occasion where something happens to His body. In fact the first time when I saw this was when I was the Vice Chancellor. He used to call me frequently to the interview room and I saw that one of His toe nails was black. I asked Swami what that was. He said, "I stubbed My toe against the door stop." I didn't know that these things happen to God. I said, "Swami, how does it happen to You?" He said, "How it happens to you, it happens to Me." I said, "Swami, it must be very painful." He said, "Of course, what else do you think?" Then I told Him, "Swami, tomorrow is Vinayaka Chathurthi; you generally walk with a very long robe. Your toe will not be visible; everyone will be grabbing Your feet and it will be very painful." He replied, "Yes, it will be painful. But can I tell the devotees not to approach Me? If you do anything like that I will wring your neck," and asked me to keep my mouth shut. He said, "Devotees come for Me and not for you. If they want to do padanamaskar, they are entitled to it." I was reminded of a slokha (hymn) in Shivanandha Lahari where Adi Shankara wails to Shiva: Oh Shiva! You are so tired after Shiva Thandavam (Cosmic Dance of Shiva) and all the Devas are not even removing their crowns; it must be hurting Your feet. It was very moving. But here we see an entirely different kind of leela where Swami is suffering pain. As Rama He suffered pain in terms of separation, anguish and all those things; but here it is in terms of physical pain, bodily suffering and all that. This is completely mystifying and we have never had this sort of situation. To a small extent it was there when He had the fracture in 2003. So I now want to ask you as a devotee how did you feel when you heard all this in America? You were in America when this happened, right? This is a human form in which every Divine entity, every Divine principle, that is to say, all the names and forms ascribed by man to God are manifest. Do not allow doubt to distract you. If you only install in the altar of your heart steady faith in My Divinity, you can win a vision of My Reality. Instead if you swing like a pendulum of a clock - one moment devotion and another disbelief, you can never succeed in comprehending the truth and win the bliss. You are very fortunate that you have a chance to experience the bliss of the vision of Sarva Devatha Swaroopam (the form which is all forms of Gods) now in this life itself. Here I want to add something with reference to the comment you made. Swami has said that in truth you cannot understand the nature of My Reality either today or even after a thousand years of steady austerity or ardent enquiry, even if all mankind joins in that effort. This shows people have their own imaginations Swami has taken the negative karmas, Swami took somebody's illness; Swami did this for this reason, etc. Here Swami Himself is telling: Don't try to understand Me. He has also personally told me repeatedly: You have experienced My love and My Divinity. So just share that Love and Divinity. We can never analyse Divinity, and in fact when God comes in human form, as you mentioned about Rama He cried like an ordinary human being for Sita. When Krishna came He went as an Ambassador and made His mission fail and allowed to be bound by those people. When Jesus came He let Himself be crucified on the cross. Why God comes in the human form? It is beautifully shared in the Vishnu Sahasranama: When God takes the human form, He has this confounding aspect. He would play like a human being and be Divine at the same time. So in my humble opinion this Divine drama as it unfolds this is His Sankalpa (Will) and we will be learning lot of things and it is for our highest good because Swami says without His Sankalpa not even a blade of grass can move! Even the Quran says not even a dry leaf can fall from the tree without the will of God. He has willed it so and it is for the highest good and right now I can see the good coming in the form of the intensity of the Sadhana, which people all over the world are doing at this time. And also the sense of unity with which people are coming together. We really intensely hope that Swami comes out of this the way He has done before and is amongst us again, giving us the opportunity to enjoy His beautiful Darshan, blessing and sweet loving words. Prof. GV: As you were saying all these things, I was reminded of one of the things that late Prof. Kasturi has recorded. I think it was after the Guru Poornima incident 1963. Swami was back to normal and devotees were again chatting with Him. One of them a typical devotee said, "Swami, You don't know what hell we went through when You were putting us through to the test for eight days, we had to go through so much anguish. Why do You inflict on Yourself all this suffering?" The man forgot that God suffered. Do you know what reply Swami gave? He said, "Don't talk like a fool. The anguish that you felt for the last eight days you would not have felt for Me in eight janmas (life times). I pressed the fast forward button in order to bring you closer to Me." He used modern language. Dr. NR: This is a beautiful revelation. Prof. GV: We hardly think of God. Dr. NR: Yes, that is a very good point. I will just side track and tell you one instance. This happened about 15 or 20 years back. I was going with Swami in the car. I asked, "Swami, how do I know whether I have devotion." Swami said in Telugu, "Neeku theevra parithapamunte, neeku Bhakthi unnattu" it means, if you have intense longing for God you have devotion. As Ramakrishna Paramahamsa said, "People cry jarful of tears for family. But if you intensely cry for God in three days you will have darshan of the Lord." Here I feel Swami is giving us the opportunity to do that. I come across so many devotees now whose minds and hearts are fully focused on Swami. They are asking what can I do for Swami instead of asking what can I get from Swami. 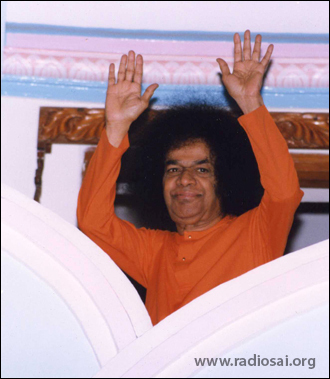 to offer their love to Bhagawan and sincerely pray to Him to heal Himself at the earliest. There are thousands of physicians who are devotees of Swami many of whom are high officials and chairmen of many departments in major medical schools they all want to come and serve Swami. I humbly said to them that there are only limited number of people who can physically serve Swami. The others even though they are physicians, the best thing they can do is to pray to Swami intensely. He Himself has said that the best medicine for Me is the prayers of the devotees. 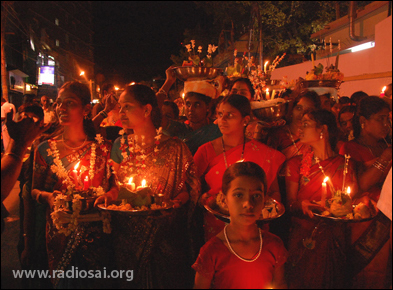 In fact this is Swami's quote: "The intense prayers of the devotees are My medicine. This body is not Mine; it is yours. Hence it is your responsibility to look after My body." How do we do that? By intense prayers because many times we have heard that God is moved by prayers. So this is the time when all of us have to intensify our sadhana and Swami is giving an opportunity and I am happy to say many devotees are doing that. I wish we can do more of this kind because only by going inward we can please Him. Swami says, though we are all worried about His nourishment, He has said 'Bliss is My food'. So if we devotees practise His teachings and be blissful, then Swami's body will be nourished too. I am talking as a devotee now and not as a physician. Of course they are giving proper nourishment and proper treatment; but as devotees we need to go inward and practise His teachings. That is why in Lalitha Sahasranama it is said that only when we go inward can we attain God. That is one of the most beautiful sayings in that hymn. Swami is giving an opportunity for all of us to go inwards and dive deep into His teachings and practise. Prof. GV: Regarding that I would like to just make one small remark before we wind up. Actually it is a recall of what Swami has said in His typical simple way. Swami says that devotion is not an on and off kind of thing. I would like to compare it with electricity here. These days current comes and goes off. He said it is not like a uniform that a policeman wears when he goes on duty or a burkha that a Muslim woman wears when she goes out on the street. It must be there always. Unfortunately we have a tendency to go back to our own old ways, once Swami is back to normal and forget His teachings. I am glad you referred to His teachings. At least this time we must seriously come back to His teachings. One of the things that I feel concerned is many people write to us based on rumours that they hear. Now, anxiety is one thing, but how do you get to know rumours? Because you are tuned to them. Otherwise they won't reach you; they will not penetrate you. These are some of the lessons that we must learn. It is time that we start becoming serious. You talked about vedhana, parithapam and all that. Unless we really value it, it will not be there. It should not be momentary and transient. I don't know if you agree with me; but as a teacher I feel that God comes as a teacher for us to learn and if we don't learn we are very bad students. Dr. NR: That is very important. It cannot be a temporary thing. That is why Swami says: Sarvadha Sarvakaleshu Sarvathra Hari Chinthanam, that is, constantly think about God all time, everywhere and under all circumstances. Otherwise He says you are a part-time devotee and want full-time benefits. In the Gita, Lord Krishna beautifully says: Yogakshemam Vahamyaham, that is, I am going to take care. But what is the condition? Ananyas chinthayanthomam, that is, if you think of Me constantly, I will take care. People want to be taken care of by Him without constantly thinking of Him. Here I want to share with the listeners another important point. 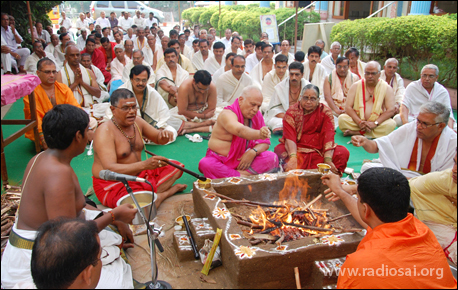 In the same discourse Swami has said how to make the best use of Swami. He says, "Utilise the chance of association with Me as much as possible and endeavour as quickly and as best as you can to follow the directions that I have been giving. Obeying My instruction is enough. It will benefit you more than the most rigorous asceticism. Practice Sathya, Dharma, Shanthi, Prema which are dear to Me. Resolve to keep those ideals before you ever." That is why Swami always addresses us as Divyathma Swaroopalara (Embodiments of Divine Atma), Prema Swaroopalara (Embodiments of Love). He however never calls us as Bhakthulara (devotees) because He says nobody can fit that title. 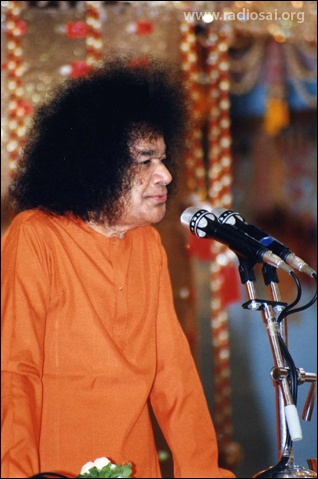 Swami is reminding us that we are embodiments of Divine Atma and Divine Love and this is the time as devotees if we want to please Swami and Swami is telling us that pleasing Him is just following His instructions. What is His instruction? Just realising that we are the embodiments of Divine Atma and Divine Love! We should realise that and help our fellow beings to realise that and manifest their Divinity. Instead of that we go into gossip, rumour mongering, etc. Actually Swami said in His discourse in 2002 that spreading falsehood and untruth is the greatest sin. We may have to pay for this karma over many life times. So why do we have to go on forwarding emails of these gossips? There are official sites of Publication Division and Radio Sai, who are doing wonderful service by releasing the official statements from Dr. Safaya. Let us stick to these and not waste time and energy. We can go inward and realise as Swami wants us all to get the title: Shrunwanthuvisye Amruthasya Puthraha. We all need to realise that we are children of immortality and that is only by removing immorality. We cannot do immoral acts of spreading rumour or gossip in any form. In fact if we truly love Swami we should not waste our energy and time gossiping and spreading rumours. Prof. GV: You referred to Obey My instructions. I will wrap it up by recalling two words which have some relevance because it is about doctors and what Swami has said about doctors. 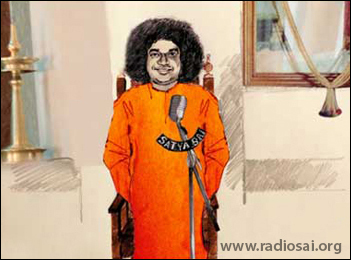 If you are sick, Swami says, you go to a doctor. What does the doctor do? He gives you medicine and prescribes diet restrictions. Medicine is aushadham. Diet restriction is pathyam. People come to Me with sickness. Like a doctor I also give aushadham and prescribe pathyam. What is Swami's aushadham? It is Namasmaranam. What is Swami's pathyam? Obey My commands. It is very simple. So on this occasion when we are talking about how doctors are treating Swami it is very useful and pertinent that we recall how Swami has given instruction to us as the Divine doctor. Dr. NR: That is a beautiful concluding statement. Actually I shared this in one of my talks and Swami liked that because He repeatedly says this; we have to get our Bhava Roga (the disease of being in the material world) cured. Prof. GV: I would just wrap it all by saying it was really nice of you to have spared some time. I know you are really busy, especially today. But you have been so kind. You have not only shared with us lot of your medical wisdom, but a bit of your spiritual insight too. More than anything else, we have been carrying the burden of anxiety of devotees all over the world and we had no way of assuring them from the medical angle. You have helped us enormously and we owe a deep debt of gratitude to you for that. Thank you again on behalf of all of us here in the studio and listeners/readers all over the world. I hope the next time I see you here we will be talking spirituality and not this kind of topic. Thank you very much. Sai Ram. 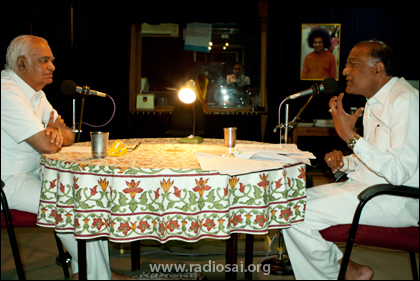 Dr. NR: I thank Bhagawan and yourself Dr. Venkataraman, the entire Radio Sai team, and the listeners/readers for giving me this opportunity to share Swami's Message and Love. Jai Sai Ram! Copyright 2009 Sri Sathya Sai Media Foundation. All rights reserved.